New private comfortable 5-storied "Rialto" hotel was put into operation in 2001. It is located in one of the central regions of the city. The distance from the city center to the hotel is 5 km. The Rialto offers 24 comfortable rooms equipped with new Italian-made furniture, large double beds; two-rooms junior, senior & grand suites consist of a bedroom and a living room. All rooms have private facilities (shower),autonomous water heating system, hair dryer, satellite ÒV, Japanese split air conditioning system, fridge with a mini bar. 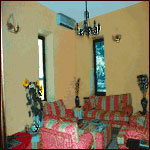 fax and microwave furnace; bathrooms of grand suites are supplied with Jacuzzi with hydro massage facility and TV. Although there is no restaurant at the hotel, meals can easily be ordered at one of the local restaurants and delivered to your room for extra charge. Donetsk , Ukraine Donetsk 45590.